WE OFFER PRIVATE BOAT CHARTERS FOR GROUPS THAT WOULD LIKE TO GO OUT FOR AN AFTERNOON OR EVENING OF FISHING. PERFECT FOR CORPORATE CHARTERS OR ANY GROUP LOOKING TO HAVE THE BOAT TO THEMSELVES. CHARTER THE BIG MOHAWK FOR YOUR OWN PRIVATE SUNSET CRUISE. SAIL UP AND DOWN THE BEACH AND CELEBRATE ANY OCCASION, OR JUST COME AND PARTY WITH YOUR GROUP OF FRIENDS. The Captain Cal II sails out of the Belmar Marina on Route 35 in Belmar, NJ. We are a family owned and operated 75’ party boat that is US Coast Guard inspected & certified for safety. Fully equipped with the latest safety, navigational and electronic fish finding equipment. Clean and separate men and women restroom facilities are just some of the featured comforts found aboard. We fish for fluke, sea bass, blackfish, bluefish, porgies, ling and other fish in season. Captain Ron has over thirty years of boating and fishing experience. He is familiar with all of the areas' fishing spots & grounds to bring home that trophy fish, and to bring you the best deep sea fishing experience! Captain Rich Falcone and the crew of the GOLDEN EAGLE provide its customers with an “Extraordinary Fishing & Cruising Experience”.Including the best possible customer service and a family friendly environment. The GOLDEN EAGLE is built for speed & comfort allowing for more fishing time during a comfortable relaxing day in the ocean. Fish New Jersey with the most experienced captains & crew in business over 76 years. 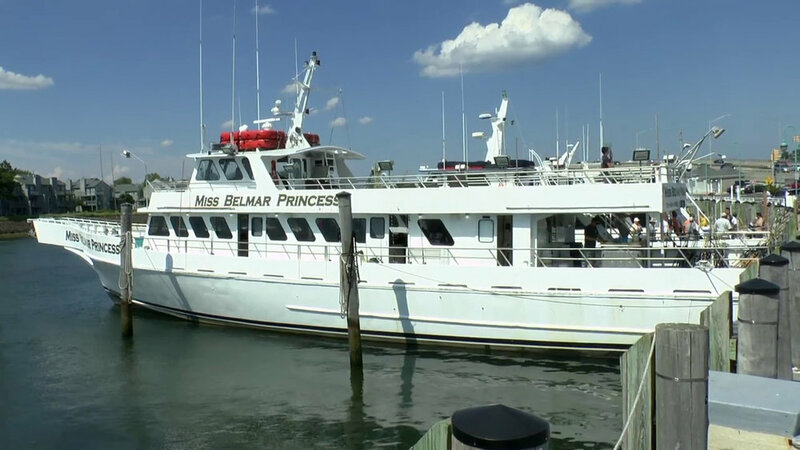 The Miss Belmar Princess is perfect for every event – personal or business, small or large! Whether it’s bait fishing, jigging big blues or chunking in the canyons for yellow-fin and big eyes, The Miss Belmar Princess and Royal Miss Belmar are ideal for all of your deep sea fishing needs. SAILING DAILY FOR STRIPERS & BLUES FROM 7:30 A.M. – 2:30 P.M. Phone: (732) 681-6866 OR (732) 681-0030. Daily Deep Sea Fishing Charters in Belmar, NJ. Come on down and experience a great boat with a great crew. We are super friendly and helpful on deck to those both experienced and those who are taking their first boat trip. We look forward to seeing you!